Previously, we were sending a newsletter out each month. However, going forward, we have decided to switch to a quarterly format. That means we will aim to send a newsletter out at the mid-point of each climatological season - winter (January), spring (April), summer (July), and fall (October). We hope that this change will increase the currency of the information in the newsletters. As we've been seeing lately, winter can bring a mixed state of affairs to Florida, depending upon the part of the state. Winter is the dry season in much of the peninsula. However, for the panhandle and far northern peninsula (say, north of Gainesville), a secondary wet season characterizes winter. Cold fronts will often become stationary in or just north of this area, bringing periods of inclement weather. Indeed, several rounds of very heavy rain have impacted the panhandle since Thanksgiving, alleviating drought concerns there. By contrast, save for a handful of cold fronts that have made it sufficiently far south, the weather pattern has been quiescent and rather mild so far this winter on the peninsula. So, even if it's quiet in the rainfall department at your particular location, please do report daily totals of zero. It's critically important for meteorologists and other stakeholders to know where it's been dry, especially as Florida's wildfire season approaches by late February and March. Thanks in advance for your effort on this! In this newsletter, you'll find a reminder of how to handle dew that collects in gauges, an announcement of our March Madness recruitment effort, a review of CoCoRaHS in Florida for 2016, and an update on drought conditions and a seasonal outlook. As always, keep in touch if you have questions or want to share interesting photos or stories. Reminder: Dew is Not Precipitation! Sometimes dew will form inside the gauge and fill it to near or just above the 0.01" mark. During many nights, especially during the cooler part of the season, dew will form on many outdoor sources. Dew forms when the air temperature falls during the night and approaches the dew point temperature, the temperature at which air will condense into water. Sometimes, this dew will be heavy enough to accumulate in rain gauges and register as a trace or even 0.01" or 0.02" even if no rain has fallen. Recall that you are measuring precipitation (almost always in the form of rainfall in Florida). Dew is condensation, and condensation is not precipitation. Therefore, in instances of heavy dew in which a liquid registers as an amount in your gauge, yet no rainfall has fallen, please report the total as zero. Perhaps you could include a note in the comments to state what you saw. Every March, a national effort in CoCoRaHS known as "March Madness" is undertaken to recruit new observers into the network. All 50 states and the District of Columbia compete in recruiting the greatest number of new observers. The number of recruits is measured in two ways: an absolute count (meaning that a high-population state has the best chance of greatest recruitment) and a count that a normalized by states' populations (which gives a low-population state, like Wyoming, as great a chance of winning the competition as a high-population state, like California). The winning states receive the CoCoRaHS Cup (pictured above). We hope to get a large number of new observers here in Florida. At this time, we are soliciting suggestions for ways to get the word out about CoCoRaHS. If you have any ideas, please send them our way! 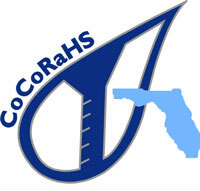 From 1 October through 24 January, 27 new observers joined CoCoRaHS in Florida. A hearty welcome to the observers at the following stations (listed in chronological order by join date): BW-107, MD-66, BW-108, PN-65, BW-109, BY-14, BW-110, PB-83, BV-63, PK-51, LE-53, ST-28, BV-64, BW-111, OK-38, FY-24, CY-41, MC-33, BW-112, BW-113, BV-65, FR-7, OK-39, MR-51, DV-80, CT-18, and LK-27. Observer comments are encouraged! Here are some that have caught our eye recently. 16 October 2016, Shalimar 1.0N, Okaloosa County (OK-16): "It has been dry for so long, a spider has now taken up residence in my rain gauge." 28 October 2016, Summerfield 3.0NE, Marion County (MR-32): "Beautiful days and nights the last couple of weeks BUT where is the rain?" 3 November 2016, Live Oak 0.4NE, Suwannee County (SW-1): "Heard the rain yesterday morning as it came down the street. Heard it, saw it, smelled the aroma - but nothing in the rain gauge. Drats!" 3 January 2017, Pensacola 18.9WSW, Escambia County (ES-24): "Heavy T-storm around 2:40, lasted almost a hour. Checked rain gauge at 1700 and it had recorded 2.70 since 0700. Two additional heavy storms rolled through, the last one around 2100. Another 1.24 in gauge this morning for a total of 3.94 for the 24 hour period. The rain was very heavy and caused a lot of run off. Observations this morning showed that low areas have a lot of standing water and half of road in front of house was covered with water. Small branches down in yard." 23 January 2017, Cross City 4.7E, Dixie County (DX-2): "Wind blew strong most of yesterday. around 5 pm wind increased and started including some rain. An extremely strong gust occurred around 5:30 PM and at 5:33 I caught on camera a section of the crown of one of my live oaks falling into my front yard. No damage but it did brush across the power lines as it fell but so far I have seen no damage." 23 January 2017, Panama City Beach 5.9WNW (BY-10): "This was the very end of the storms that hit the Panhandle on Saturday night/Sunday morning. My location was spared the worst of it as the storm line broke in two and the break passed over my location. Still, the winds splintered a large palm tree at the entrance to the development." As of the time of the last newsletter in October, drought conditions were taking root on the panhandle and in the far northern section of the peninsula inland from the Atlantic Ocean, where Hurricane Matthew had just passed, bringing heavy rains to near-coastal areas. As November passed and December arrived, drought conditions intensified in the northern areas amid historically long streaks without measurable rain falling and began encroaching on the peninsula. A series of rainfalls commenced in early December, with most recent one on the third weekend in January, in North Florida and adjacent parts of the interior Southeast to the north, brought along by slow-moving or stationary cold fronts that traversed the region. The image below maps rainfall totals in Florida for the 60-day period ending on the morning of 24 January. Consequently, drought conditions in north Florida have abated, while abnormally dry conditions remain farther south, according to the late US Drought Monitor, shown below. Below is a comparison between the US Drought Monitors issued on 1 December 2016, when drought was at its peak on the panhandle, and on 26 January 2017, the most recent one. Going forward into the late winter and early spring, an increased probability exists of warmer-than-average and drier-than-average conditions across all of Florida, according to the latest three-month outlook from NOAA's Climate Prediction Center. This outlook is consistent with the weak La Niña (ENSO-negative) conditions that appear to be fading in the equatorial Pacific Ocean. Although the imprint of La Niña seems to be decreasing in the ocean, a lag in related atmospheric conditions is to be expected.